In July 2018, not long after my appointment as Dean of the Faculty of Medicine, I wrote in the College Staff Briefing about the distinctive environment that medical science now enjoys at Imperial. I wrote of the extraordinary benefits of Medicine now being well-embedded within the wider ecosystem of excellent fundamental science at the College, while working translationally with our AHSC network of NHS partners. I also described the new opportunities that have been catalysed across the College by the development of our White City Campus, particularly through exploiting adjacency to the Hammersmith Campus. Since I wrote that piece, Novartis have announced their intention to relocate their UK headquarters to White City, elegantly demonstrating the ‘pulling power’ of our emerging life sciences cluster. I believe that it has taken 20 years from the merger of the West London undergraduate and postgraduate medical schools with Imperial in 1997, for Medicine to fully grasp the opportunities of the College and vice versa. We can now see that the opportunities sown by that merger are truly bearing fruit. Examples of success in attracting external funding for major, interdisciplinary programmes include two awarded UK Dementia Research Institute centres, our CRUK Imperial Centre and the recently announced renewal of our BHF Centre of Research Excellence. Such examples highlight the compelling story we are now able to tell about the collaborations between medicine and our outstanding engineering, business, physical and life sciences across Imperial. Similar opportunities exist across many health areas, such as AI, AMR and vaccine development, for which the College recently made the case to global leaders at DAVOS for joined-up working to deliver more effective strategies. In late summer of last year I launched a one-year process for reorganisation of our current Faculty into eight departments from August 2019, to create a more thematic structure and ensure broader engagement with Faculty strategy and decision making. I believe that these eight departments (comprising the existing Institute of Clinical Sciences, NHLI, Surgery and Cancer and School of Public Health, with new departments for Infectious Disease, Inflammation and Immunology, Brain Sciences, and Metabolism, Digestion and Reproduction), will create a framework which will be more effective in delivering interdisciplinary working, more supportive for staff at all levels and above all, more enjoyable. Our new Heads of Department, announced in December are already working together and with the Faculty’s leadership team to realise the opportunities which exist across Imperial for health-related science and translational collaboration. Over the coming five years we will deliver on the promise of the College-wide Learning and Teaching Strategy as the core of our Faculty’s academic mission. Initially we shall implement the outcomes from curriculum reviews of our MBBS degree and postgraduate taught portfolio. These developments will enhance our courses and prepare us and our students for an increasingly digital future. The recent launch of our new online Global Master of Public Health is indicative of our ambition; this is Imperial’s first fully-online degree in the health field and is already enrolling students from across the globe, to commence delivery from Autumn of this year. Our educational developments will provide new opportunities for the involvement of all Faculty staff in our education mission, re-iterating our fundamental commitment to research-based teaching. This commitment to teaching, alongside the development of a multitude of innovative programmes is giving new life to our educational culture. 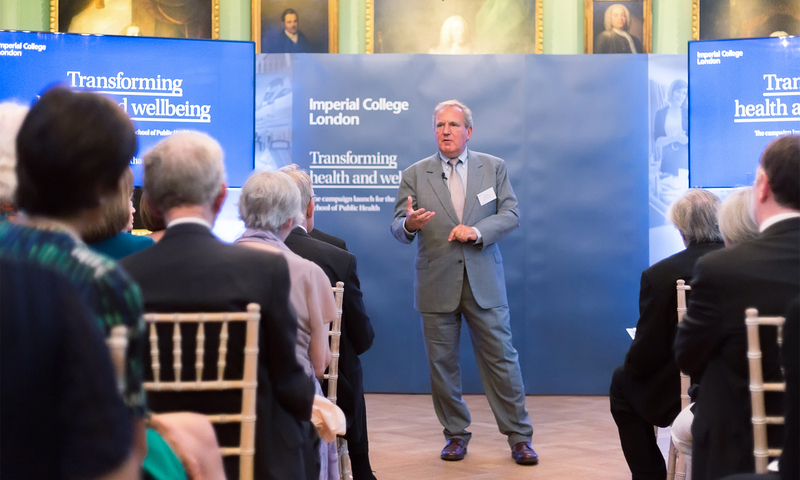 Looking forward, the redevelopment of Imperial’s campuses will now be a critical factor in how we are able to maximise our strengths across our organisation. If you have walked up from the Wood Lane tube station, you will have noticed the real transformation in the environment that is taking shape at scale at White City and why it is attracting partners such as Novartis to become our neighbours there. Next year will see the first groups from Medicine and Engineering move into the Michael Uren Biomedical Engineering Research Hub. They will join College colleagues already building their research in the Molecular Sciences Research Hub and the I-Hub, maintaining momentum in the rapid growth of our new innovation-oriented campus for bio-science. Our School of Public Health building at White City, scheduled for completion in 2023, will allow the SPH to consolidate its disseminated staff and further expand the reach and impact of its data-powered approaches to improving population health. Just around the corner at the Hammersmith campus, the planning is advanced for the new home for the MRC London Institute of Medical Sciences. Between now and 2023 our planning work within College and together with our NHS partners will accelerate. We want to exploit fully the multidisciplinary, inter-Faculty and translational opportunities that now offer themselves both at South Kensington and at our Hammersmith/White City campus. We want to foster the most effective clinical research and education environments possible, across our hospital campuses. Together, we will enable and support the continued evolution of Imperial as an international powerhouse of medical education, research and innovation.